Biotar lens was a modified Double Gauss type designed by Dr.Willy Merte(1889-1948) of Carl Zeiss in 1927. This particular one is from the very first lot of production of Biotar. Perhaps it might be handled by Merte or Wanderslep directly for a quality check(might not!). Merte entered Zeiss in 1913 which was 2 years after Paul Rudolph’s retirement. He worked for lens design under Wanderslep. He worked through in Zeiss company until the end of WWII. The year he entered Zeiss was just before WWI, so I imagine he stared his work under very difficult situation, and almost at the time such condition became stable, he encountered another major event in 1926. Zeiss Ikon AG was established by merger of several optical companies and Ludwig Bertele of Ernemann entered Zeiss along with Ernostar super-fast asymmetrical type lens and also with the fame of young genius lens designer. Perhaps Wanderslep was a very broad minded person. He used such two characteristic very practically to enrich the lens line-up of Zeiss. In the next year Bertele joined, Merte designed this Biotar f1.4 for movie camera. 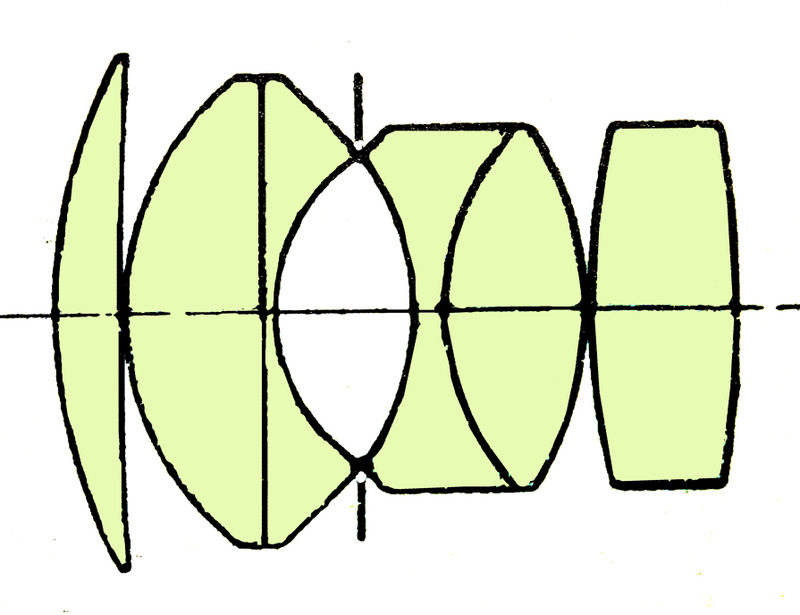 However, the lens which held the leading position after long period was not Biotar but Sonnar designed by Bertele through the modification of Ernostar. Double Gauss type lens had been spent its dark days for a rather longer period. Biotar had been produced for Robot camera, Contax, but not many. Double Gauss comes back under spot light after Sonnar lost its general versatility in the age of SLR camera with much longer flange back. Merte designed new Biotar for Exakta VP and Kine Exakta of Ihagee. Unfortunately, WWII began just after, so Double Gauss have to wait more years. During confusions after WWII, Biotar practically became the name of Carl Zeiss Jena of East Germany. Rudolph’s Planar had come back into market in West German Zeiss. Please refer ‘Lens School’ in this HP but in Japanese. After the market competition, the name of Planar became the symbol name of Double Gauss now. The description of this 1st Biotar is very precise despite its age. In the closed aperture, I could not distinguish the difference with modern Double Gauss lenses. Of course however, at full aperture, it shows many bokeh and flows because of bigger aberrations.of question. It was a find and clear day which is typical atmosphere of Kanto area in winter. I used at around f4.0 on pictures under sunshine. You may realize aberrations on pictures at full aperture of Plants and others, otherwise Biotar shows sharp image with closed aperture.